Do you enjoy some of the online genealogy prompts to look at your data from a different viewpoint? I know I do. 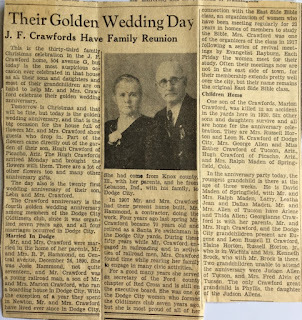 Two of my currents sources for blogging prompts are Amy Johnson Crowe's #52ancestors and Randy Seaver's #SaturdayNightGenealogyFun. 1) How many of your ancestors were married for FIFTY years? 2) What is the longest marriage in your tree? I'm approaching my 45th wedding anniversary and my parents were married for over fifty years. 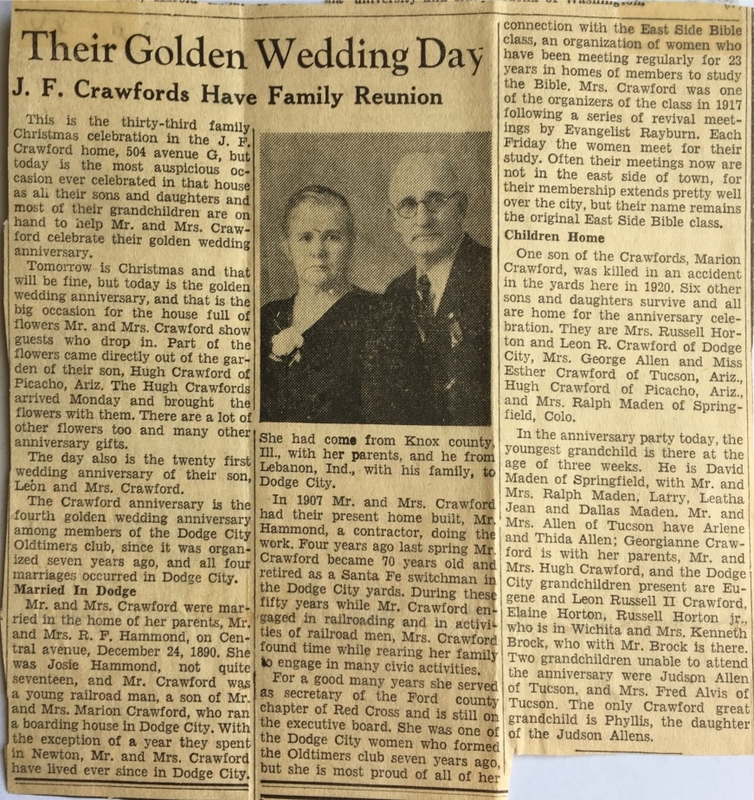 Leon Crawford and Winnie Currey -- married Dec 1919; They were married 56 years before Leon passed away in Oct. 1976. Edward Osmond Briles and Pauline Mentzer were married Oct 1915. They were married 40 years when Edward passed away. Pauline never remarried. Judson Crawford and Josie Hammond were married Dec 1890. They were married 58 years when Judson passed away. Edward Grant Briles and Frances Artlissa "Artie" Rickeets were married in Feb 1890. They were married 57 years when Artie passed away. Charles Mentzer and Nettie Wells were married in Oct 1893. They were married 46 years when Nettie passed away. Washington Marion Crawford and Mary Foster were married in March 1860. They were married 29 years when Washington Crawford passed away. Mary Crawford never remarried. Richmond Fisk Hammond and Sarah Ellen Ralston were married in Jan 1867. They were married 25 years when Sarah passed away. Richmond married Mary McClure in 1897. In 1906, Richmond married Mary Reynolds. Hiram M Currey and Angelina Jane Burke were married in 1856. They were married 44 years when both Hiram and Angelina passed away. Albert Hutchinson and Julia Harding were married in 1859. They were married 33 years when Julia passed away in 1892. Albert passed away in 1896. Noah Briles and Sarah Thompson were married in August 1866. They were married 13 years when Noah passed away. Sarah married J. D. Davis but later divorced him. James Marshall Ricketts and Rachel Christy were married Jul 1866. They were married 54 years before James passed away in 1920. Rachel passed away 7 years later. George Mentzer and Emeline Minnick were married in 1867. They were married 45 years when George passed away in 1912. Emeline never remarried. Thurston Kennedy Wells and Salme Adell Crandall were married in May 1861. They were married 35 years when they both passed away. This was Thurston's second marriage after the death of his first wife, Sarah Hall. Nelson G. Crawford and Martha Smith were married in 1833. They were almost married 32 years when Nelson passed away. Martha never remarried. Zebulon Foster and Caroline Ostrander were married in 1833. There were married 38 years when Caroline passed away. Zebulon then married Juliet Fleming. Horatio Hammond and Louisa Fisk were married in 1825. They were married 49 years when Louisa passed away in 1874. Horatio died in 1879. James Barr Ralston and Nancy Jane McCormick were married in 1836. They were married 68 years when James passed away in 1904. Nancy died three years later. Hiram M. Currey married Rachel Harris in 1824. Death dates are unknown since records cannot be found for 1850 or later. Henry F Burke married Elizabeth Bland in 1835. They were married 10 years when Henry passed away. Angelina may have remarried but documentation has not been found. William G Harding and Elizabeth Fowler were married in 1830. They were married 16 years when Elizabeth passed away. William then married Eliza Henderson. Alexander Briles married Sarah Rush in 1836. They were married 36 years when Sarah passed away. Alexander then married Elizabeth Ellsworth. William Taylor Thompson and Polly Ann Evans were married in 1842. They were married 46 years when Polly passed away in 1896. William died in 1898. John Lewis Ricketts and Orilda Reed were married in 1846. They were married 42 years when John passed away in 1888. Orilda died in 1900. Samuel Christy and Lyda Gallimore were married in 1842. They were married 22 years when Lyda passed away. Samuel then married Mariah Burk and Mary Susan Amos. Phillip Andrew Mentzer and Orinda Miles were married in 1816. They were married 29 years when Phillip passed away. John Minnick and Elizabeth Mary Jones were married before 1850. They would have been married at least 16 years when Elizabeth passed away. John then married Phebe Tripp in 1870. Ozias Wells and Mary Keneedy were married in 1818. They were married 14 years when Ozias passed away. A marriage date for Lewis Crandall and Almira Nafus is unknown at this time. Almira passed away prior to 1846 when Lewis Crandall married Anna Tuttle. Counting my parents, I have SIX sets of ancestors married for 50 years. The longest marriage in my tree was for James Barr Ralston and Nancy Jane McCormick. good one! I'll use it, if you don't mind, with credit to you and your excellent list. Where Is the Sellers' Land?